Building a culture that includes both brain research and the arts, the University of Maryland’s Brain and Behavior Initiative is involved in a unique partnership—working with Arena Stage in Washington, D.C., in conjunction with its upcoming play, Smart People by Lydia R. Diamond. The play explores the unavoidable nature of implicit cultural bias through the lenses of neuroscience, psychology, medicine and the arts. In the play, four intellectuals—a doctor, and actress, a psychologist, and a neurobiologist studying the human brain’s response to race—search for love, acceptance and identity in a complex world where political correctness comes face-to-face with cold, hard data. Do our belief systems stem from our environment, or are some prejudices hard-wired into us? The performance is both controversial and fiercely funny, and runs from April 14–May 21. Two special events mark the innovative UMD-Arena Stage partnership: A free night out to the play for 200 UMD students on May 4, and a special panel discussion on March 13. Before the play begins its run, on Monday, March 13, Arena Stage will host a free “Smart Talk” panel discussion at 7:00 p.m. in its Molly Smith Study. The panel will be led by the director of Smart People, Seema Sueko. It features two panelists from the University of Maryland: Reza Ghodssi (ECE/ISR), the director of the Institute for Systems Research and one of the founders of the Brain and Behavior Initiative; and Kelsey Leigh Canada, a graduate student in the Neurocognitive Development Lab. Other panelists include Soyica Colbert, an African-American and Theater and Performance Studies professor from Georgetown University; Chris Denby, the executive vice president of the Advisory Board Company; and Tiffany Townsend, who directs the Office of Ethnic Minority Affairs at the American Psychological Association. The panel will bring their understanding of science, technology, engineering, arts and mathematics (STEAM) to the discussion. They will give insight into their own work and expand on the themes in the play. Reservations are requested to attend; learn more here. 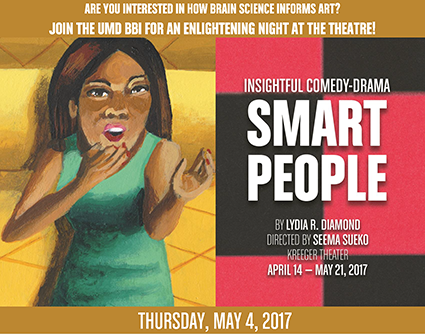 Then, on May 4, BBI and the UMD Division of Research will be offering free tickets and transportation to see Smart People at Arena Stage to 200 students from disciplines across the university. Seema Sueko will lead a discussion before the play, and following the enlightening performance there will be a discussion with the cast, led by Sheri Parks, the UMD Associate Dean of Research, Interdisciplinary Scholarship and Programming in the College of Arts and Humanities. Students interested in attending should visit go.umd.edu/bbi-arenastage.